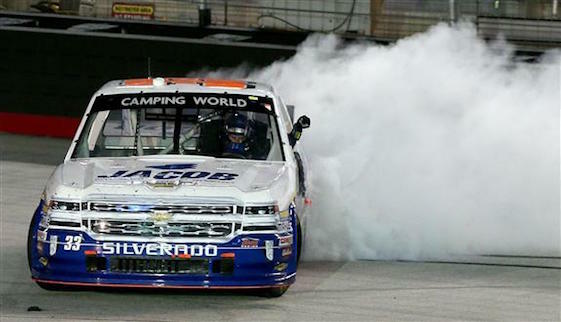 BRISTOL, Tenn. – Ben Kennedy was born into racing, but Wednesday night at Bristol Motor Speedway in the Camping World Truck Series UNOH 200 he became the first in his famous family to record a victory in one of NASCAR’s three national touring series. The great grandson of NASCAR founder Bill France Sr., the grandson of former NASCAR president and later chairman Bill France Jr., and the son of NASCAR vice chairwoman/executive vice president and International Speedway Corp. CEO Lesa France Kennedy, solidified the fact that his racing talent and knowledge wasn’t confined to the board room with his first-ever victory in the series. Kennedy took the lead on lap 181 and then held off a stiff challenge from Brett Moffitt for the next 20 laps to claim a 0.274-second victory that guaranteed him a position in the series title Chase. “If anything, this is a little bit of validity for me,” said Kennedy, who admitted shortly after his victory that his accomplishment had yet to “sink in.” “This is a good experience for me no matter what I end up doing. Hopefully, I’ll have a long career in the racing industry and if I don’t, I have cool experiences to look back on. Christopher Bell and Daniel Suarez dominated the race that was delayed by an hour due to rain. Bell led twice for 101 laps, while Suarez set the pace on three occasions for 77 laps. Both, however, encountered problems. Bell spun on the backstretch on lap 143 while battling Suarez for the lead and was never in contention again. Then on lap 187, Suarez crashed in the second turn. William Byron was the only other competitor that could have foiled Kennedy’s victory charge, but he led just once before Kennedy took over. The 24-year-old Kennedy’s victory came with the second team he has driven for this season and the fourth since making his truck series debut in 2013. He began the 2016 season with Mooresville, N.C.-based Red Horse Racing, but moved to Statesville-based GMS Racing after this year’s third event. (13) Ben Kennedy, Chevrolet, 200. (8) Brett Moffitt, Toyota, 200. (12) Daniel Hemric, Ford, 200. (6) William Byron #, Toyota, 200. (7) Johnny Sauter, Chevrolet, 200. (9) Cole Custer #, Chevrolet, 200. (5) Christopher Bell #, Toyota, 200. (16) John H Nemechek, Chevrolet, 200. (15) Brandon Jones(i), Chevrolet, 200. (19) John Wes Townley, Chevrolet, 200. (10) Kaz Grala, Chevrolet, 200. (14) Spencer Gallagher, Chevrolet, 200. (25) Timothy Peters, Toyota, 200. (1) Tyler Reddick, Ford, 200. (21) Caleb Holman, Toyota, 200. (22) Jordan Anderson, Chevrolet, 200. (11) Jesse Little, Toyota, 200. (27) Austin Cindric, Ford, 199. (18) Austin Hill, Ford, 199. (24) Parker Kligerman, Ford, 199. (26) Austin Wayne Self #, Toyota, 198. (23) Stewart Friesen, Chevrolet, 198. (28) Brandon Brown, Chevrolet, 197. (3) Cameron Hayley, Toyota, 197. (30) Travis Kvapil, Chevrolet, 197. (20) Rico Abreu #, Toyota, 194. (31) Matt Mills, Chevrolet, 191. (32) Bryce Napier, Chevrolet, 191. (2) Daniel Suarez(i), Toyota, Accident, 186. (4) Ben Rhodes #, Toyota, Engine, 128. (29) Tommy Joe Martins, Chevrolet, Power Steering, 71. (17) Matt Crafton, Toyota, Engine, 70. Average Speed of Race Winner: 74.387 mph. Time of Race: 01 Hrs, 25 Mins, 59 Secs. Margin of Victory: 0.274 Seconds. Lap Leaders: T. Reddick 1; D. Suarez(i) 2-39; C. Bell # 40-135; D. Suarez(i) 136; C. Bell # 137-141; D. Suarez(i) 142-179; W. Byron # 180; B. Kennedy 181-200. Leaders Summary (Driver, Times Lead, Laps Led): C. Bell # 2 times for 101 laps; D. Suarez(i) 3 times for 77 laps; B. Kennedy 1 time for 20 laps; T. Reddick 1 time for 1 lap; W. Byron # 1 time for 1 lap. Top 10 in Points: W. Byron # – 349; D. Hemric – 312; J. Sauter – 306; T. Peters – 302; C. Bell # – 296; M. Crafton – 295; B. Kennedy – 287; J. Nemechek – 281; C. Custer # – 273; T. Reddick – 270.